T2-MI packet analysis. It can receive a T2-MI signal in the form of both ASI or IP formats, performing IP transport quality measurements, T2-MI packet analysis and PLP de-encapsulation. dCSS LNBs. It stands for Digital Channel Stacking Switch LNB and they come to take multiuser single cable distribution systems one step further. Ethernet connectivity for remote control. Besides remote control the IP interface can be used to save or retrieve data from a PC, copy channel tables or installation information, dataloggers, copy transport stream files, screen shots, etc. 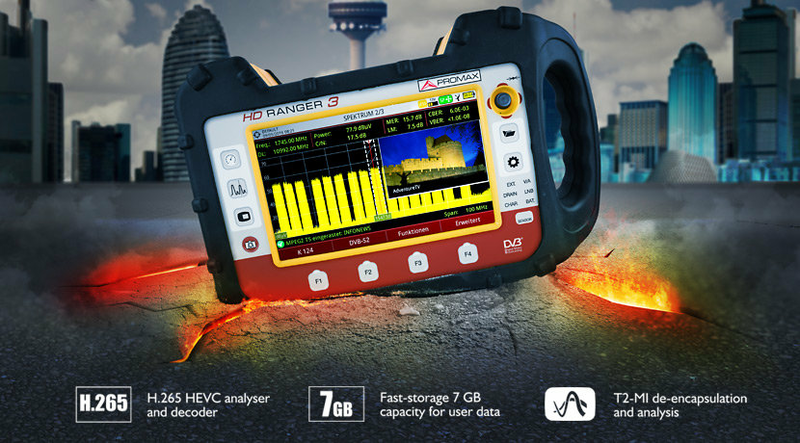 Optical measurements and 3 GHz band extension can also be included as an option, thus converting the HD RANGER 3 in an all-purpose field strength meter.